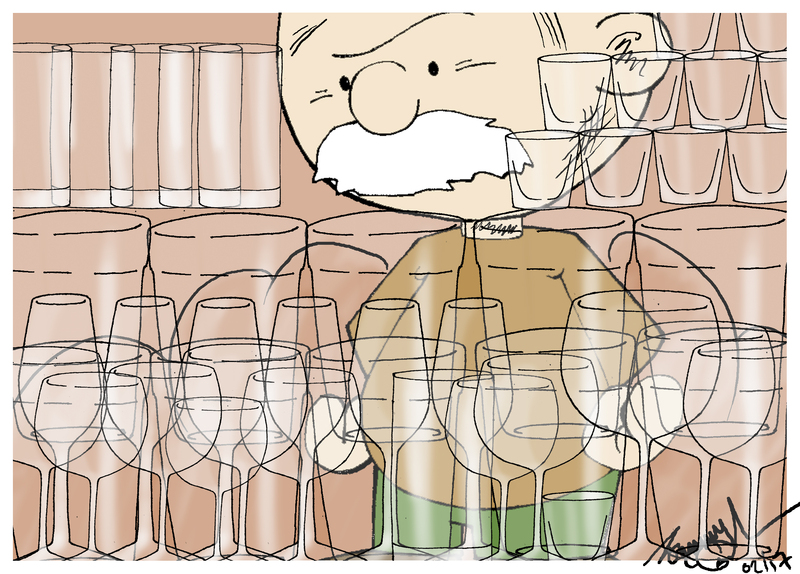 You can never have too many glasses. I don’t know who said that, but he must have lived in our house at one time, because we have enough of them for a royal wedding. Where did they all come from ? And. Why have we still got them ? We have glasses for everyday use in the kitchen cupboard. Then there are glasses ‘for best’ in the lounge in two more cupboards. A few are strategically located in the study next to the decanters on the desk in case my books drive me to drink. Finally the last resting place of all the left over odds and sods of fractured glasses sets and prised possessions of a life of tippling are stored in Aunty Dorothy’s cupboard. Aunty Dorothy’s cupboard is the cubby hole where things are put when there is nowhere else. Venturing into it risks an Everest avalanche of clutter which will take the rest of the day to put back. The last time we had more than two hundred around for dinner was longer than I can remember, so we must be able to shed some glasses. Most definitely not into another shed! Wouldn’t it be great to have an afternoon smashing them against a wall 😀😀😀😀 to celebrate the end of my de-cluttering ? After all the Queen does it with bottles of champagne every time she launches a new ship. And Greeks have a high time smashing plates in their restaurants. There must be a better idea for dealing excess glasses :-). Any inspiring ideas ? It takes me back to my youth and days at college or an apprentice at sea. One would enjoy a drink or two, and then at 02:00 in the morning if on the Tyne and the ship or digs were the other side of the river, one makes a lonely figure sitting on the ‘Bits’ at the ferry landing stage waiting to be carried accross the river on the first ferry in the morning at 06:00. If One was lucky, one heard a stern voice and a tap on the shoulder asking: are you all right laddie? and where are you going? It would be the night river police patrol,If one was not vommiting or completely drunk, they may offer one a friendly ride in the patrol boat acrross the river to help one on ones way to the ship or digs. The treasues tumbled out; Packet of fags; a pint glass with a guiness logo or a astel-Larger logo, Becks? ; aus ticket, and unused french letter(Too drunk to be amourous). No money all spent up on booze-broke!! Dear John as you write about the glasses, do not forget they go in the ‘Chucket File!! ‘Slangivar’ fellow bedmate. Good storey of a misspent youth with shades of criminal activity. How did you end up as the upright citizen you are today ? And ……. what do I do with all these glasses? Maybe we should have a party, so we can drink a toast 🍻 to your travels around the world and sell off your ill-gotten gains. The signs must be antiques by now and may fetch a pretty penny. John you have challenged my ingenuity, but ‘eureka’ I have an answer for you? Not very wise or good but challenging to an ‘old boy’ such as you? Put the glasses of similar types together in bundles of 8 or 10 not 6 or a dozen (Cofuse the audience? Then on your external table by your rostrum outside the front gate, or in Kilsby market square offer a challenge? Take 3 of a similar glasses as you have in a pack of 8 or 10! Turn the glasses upside down, and place a peanut under one of the three upturned glasses, then begin your slight of hand and masterful sales drive speech you are so adept at, after some motions with the hands, ask the challenger where, or which peanut does it lie, under which glass? More slight of hand, do not fox the contestant but offer them if they succeed? the pack prepacked/bundled of 8 or 10 glasses. Continue until all the glasses have changed ownership-By the way make it a challenge at £2 a go so they believe they are receiving a somewhat honoured and cherished prize!. If you are a real wizard, and tired of waiting for a challenge, fox the contestant by after your slight of hand producing a peanut one under each of the 3 glasses, and if the contestant gives you lip, or cries foul! Then make a present of all the glasses to the sucker?? Unless you take pity on the contestant if it be a younger child, the you have to eat your words and give them a bag of peanuts/sweeties. By the way do not forget to have some background music, such as Cliff Richards singing ‘Congratulations’! John, it is my secret, Molly does not know, and Mummy definitely does not. I must be careful of my image that I portray as an up right citizen, virtuous and righteous to my offspring?? My halo is slipping and strangling me! Oh Dear! !